Fresh for October a new product drop with the newest color palate of Black Swan, Heathered Tree Frog and Lilac (so far). I expected to see a lot more in store today than I did and sadly I came home empty handed. The Cabin Long Sleeve Tee’s have a new design where the second layer is not attached by a seam on either the bottom hem or at the sleeves. both pieces of fabric are also raw unfinished edges which will roll. You may love the new more ‘layered’ look but I was a bit disappointed in this. 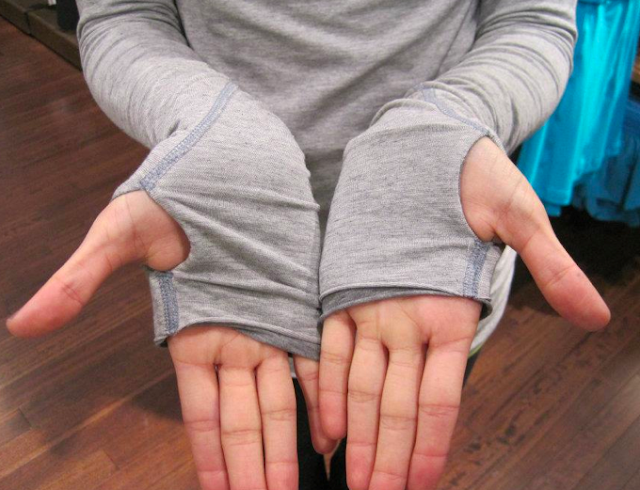 I really like the sleeve detail in the old cabins and I also liked the contrast stitching on them. Sadly I forgot to note the price on this ‘updated’ Cabin LS and that would have been pretty handy to know. 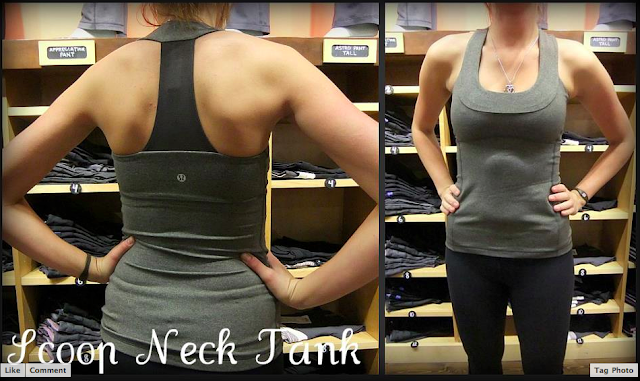 This Heathered Tree Frog Cool Racerback was actually quite pretty in person so I may consider it at a later date. This Herringbone printed Stride Jacket has an interesting texture like the Light Grey Pique. 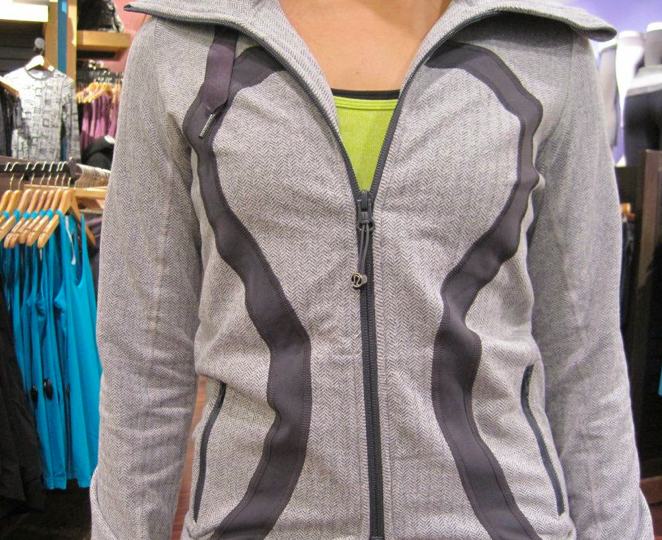 Both of the newest Stride Jackets are brushed luon on the inside. 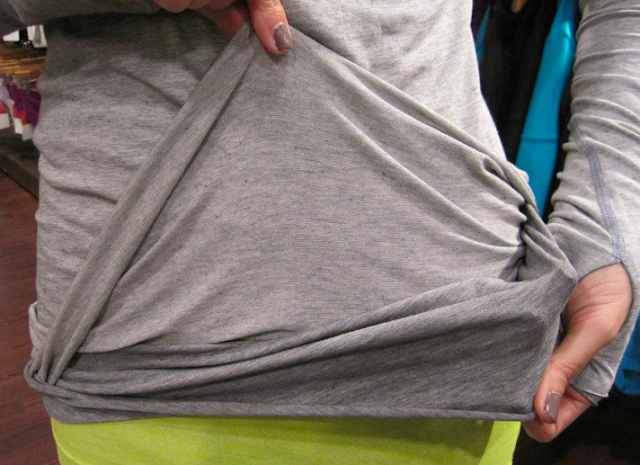 "Photos Of The Latest: Scoop Neck Tanks, Cool Racerback Tanks, Stride Jackets, Scubas and Cabin LS"
Not loving the fall greys and tweeds…snore. Would love to see some jeweltones – emerald green, ruby red, sapphire blue…no more heathered anything for me! Where is some COLOR? 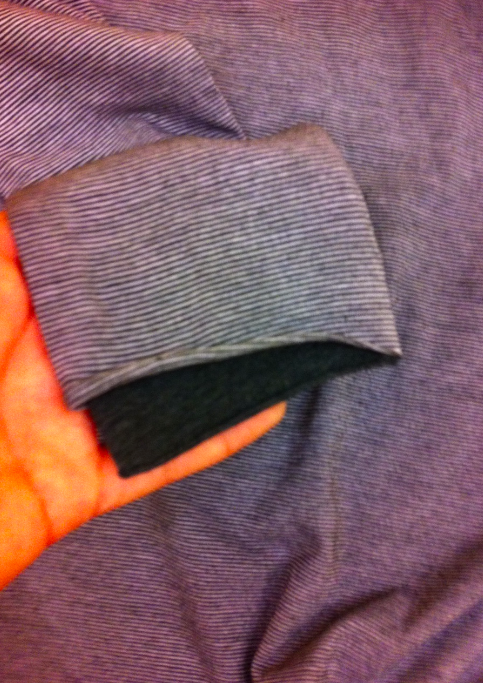 So tired of all the grey variations …. at least my wallet is safe!!! 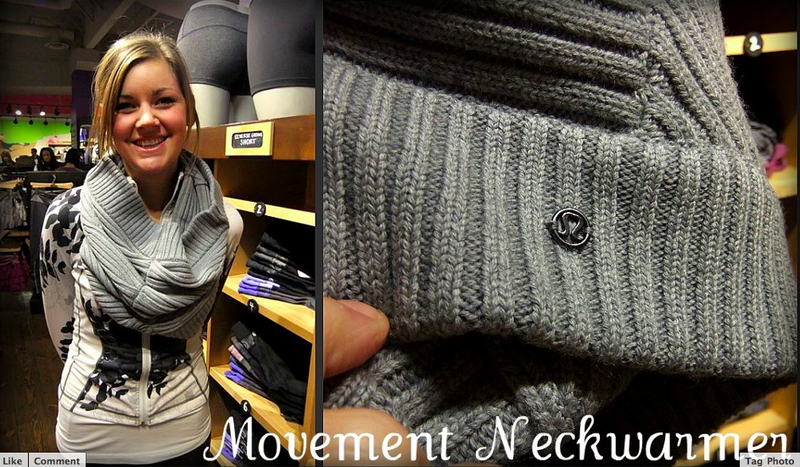 Ohhh, I love the movement neck warmer — I'm guessing it will be $48 (like the leg warmers) or even $58 — boo — just judging by the ever-growing greed! I also love the black swan stride, actually both new strides are pretty sweet — but I wish they were "IN" strides instead because I find the hood and collar combo awkward. 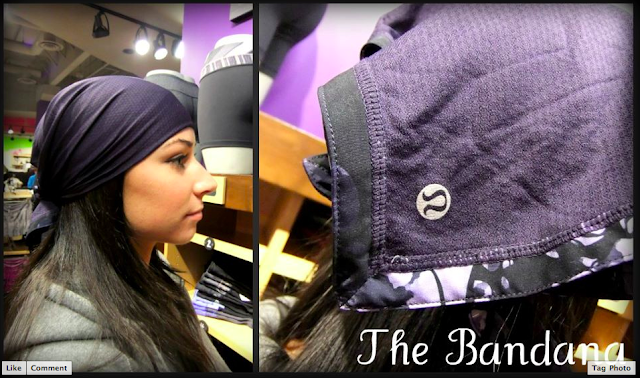 I like the bandana too, but I probably wouldn't wear it – maybe if I got it on markdown later. I went to my local store today, but didn't see any of this new stuff. 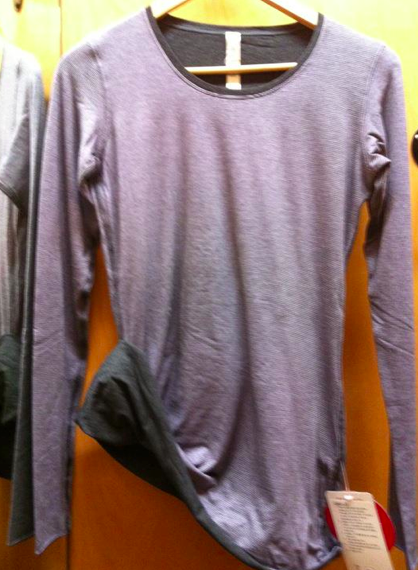 I did get a very violet SS Swiftly on markdown though — it's my 1st swiftly, hopefully it won't snag. I tried on the Wren Apres Piste and it's way nicer in person, but the back slit doesn't quite lay flat, and it has a tucked slit on the upper back between hood and waist and it puffs out a bit. 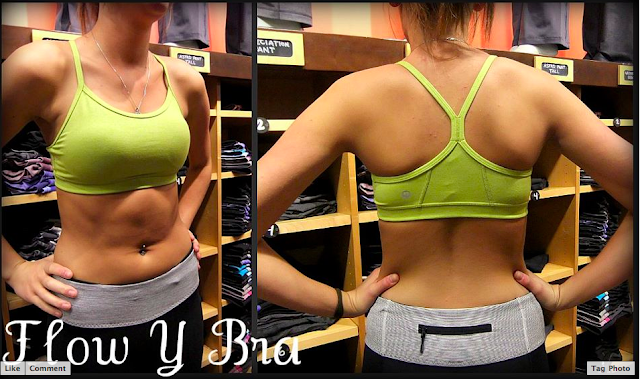 It fit TTS, with or without a scuba on. My wallet is safe…at least until the red comes in. Apparently the neckwarmer is $78?????? Lulu has gone insane. Lululemon addict posted that the Movement neck warmer is a budget busting $78 bucks. The neck warmer reminds me of a feed bag, and at 78.00 forget it!!!!! I'm with anon 1:23 pm- bring on some jewel tones!! Ugh, that neck warmer is so expensive, but I kinda like it. Hmmm- to buy or wait for it to go on markdown? I also like that print jacket that the girl with the neck warmer is wearing. Omg the edge of that bandana Looks like it has the same leaf print as the jacket in the other pic!!! I'm loving the print around the edge of the bandana. I really hope they come out with some nice stuff in that print!!! OMG! …$78?!! That's way too much! I guess I will wait and hope for a markdown, otherwise I will do without. I bought a gorgeous chunky hand knit neck warmer on Etsy and it was only $25! I went into the Lululemon store today, and they still hadn't put out any of the new stuff! they told me that tomorrow it would be out. At first I was bummed, but then I saw the white stickers on the CRB tags….so, I got indignant, and walked out. 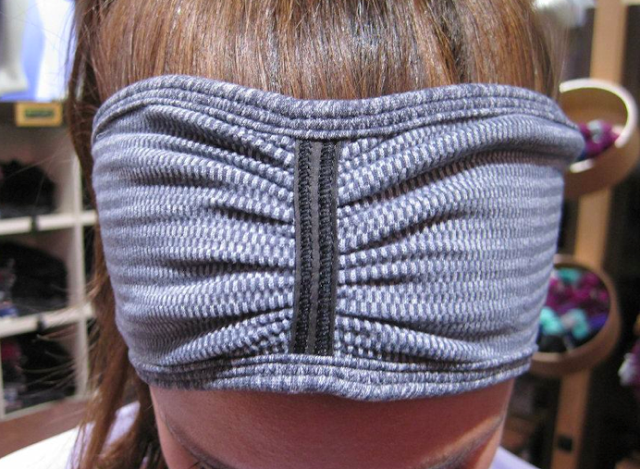 Then, I got pissed-first at Lulu for increasing the prices, then at myself, because I know that if they came out with a CRB in the pattern that lines the bandana, I would buy it. 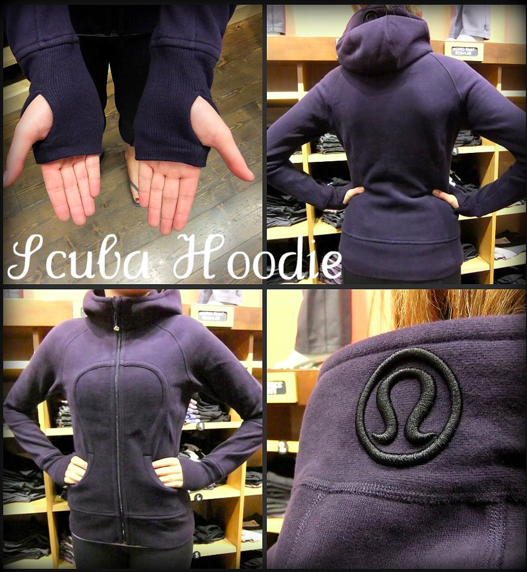 Damn Lululemon! That Movement toque is exactly my style. Hopefully it won't be too expensive, I'd be willing to pay $30 for it, but probably not more as my current favourite toque is from H&M and cost $9. I am loving all the fall greys and tweeds! The new style of Cabin LS looks like something a teenager took a pair of scissors too! Super yuck. My first thought on the Cabin LS raw edges was now at least you will be able to depill between the layers! Hah. And I can't believe the price is the same even though they didn't have to pay anyone to finish sewing the shirt together… I guess we should be glad that they didn't increase the price by $20 for an unfinished shirt like they did with the vinyasa scarves. One upside to the new Cabin LS — maybe the older "finished" edge ones will go on markdown? !